It took three days, and a LOT of coaxing, but Matt and I were finally able to brush Petey’s teeth. Petey is our Miniature Australian Shepherd, and we are totally in love with him. When he gets really excited, he grabs a toy and runs in circles, shaking his little rear end (since he doesn’t have a tail). 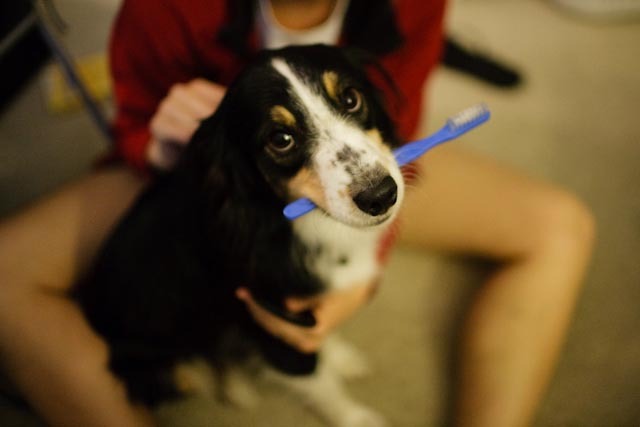 Once we finally won the battle of the toothbrush, we let him have the toothbrush and watched him go in circles. He is a cutie! Deb, I happen to find your blog and as I was scrolling down I came across this submission about your dog. I too have a miniature Australian Shepherd named Petey. He too has no tall. I hope yours is a sweet heart like mine. They’re so cute, eh? He’s a little sweety.